A chance to win over 6,000 instant win prizes or a VIP experience to the American Music Awards® on November 24th, 2013, all while playing the one-of-a-kind “Spin the Coke Bottle” digital table top trivia game. This summer, Coca-Cola® is partnering with Live Nation® and American Music Awards® for a ‘Share Happiness’ promotion occurring exclusively at Mellow Mushroom Pizza Bakers, where two lucky guests will win a VIP experience to the 2013 American Music Awards® in Los Angeles, and over 6,000 instant win prizes are available throughout the promotion including Live Nation® Concert Cash® and Mellow Mushroom gift cards. In addition to the grand prize trips and instant win prizes, guests will also have the opportunity to share virtual e-cards to friends and family, all related to the ‘Share Happiness’ and music concept of this promotion. Annica Kreider, VP of Brand Development for Mellow Mushroom HQ, is thrilled to provide this promotion and experience to our guests. "Mellow Mushroom is a brand that provides every guest with something unique and different, from the food and craft beer to the music, restaurant décor and atmosphere. We feel this Share Happiness that leverages the Coca-Cola® partnerships with Live Nation® and also with American Music Awards® provides a natural extension of this brand experience: allowing us to give our guests the opportunity to win something they couldn't buy - a VIP experience to the American Music Awards®. 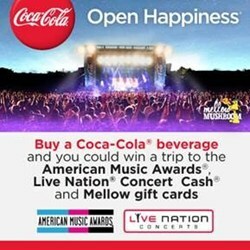 The ability to win Live Nation® instant prizes and create unique Mellow e-cards will also add a fun brand engagement that we know our guests will love." Play “Spin the Coke Bottle” at your table, an in-store digital table top game where guests can interact and learn more about each other with a series of conversation starters and trivia questions, centered around music, Coca-Cola® and Mellow—all reinforcing the fun elements of this exciting summer giveaway. “The ‘Spin the Coke Bottle’ in-store digital table top game that we have added as an experiential element of the Share Happiness summer promotion is sure to provide our guests with something they have never seen before: a fun, unique way to interact with their table mates,” states Kreider. For more information about this exciting experience and opportunity, stop into your local Mellow Mushroom now through August 31st, visit mellowmushroom.com and like us on Facebook at facebook.com/mellowmushroomHQ. For special offers and exclusive hookups, join the Mellow e-Club. Mellow Mushroom Pizza Bakers (mellowmushroom.com) was founded in 1974 in Atlanta, Georgia. This franchise, operated under Home-Grown Industries of Georgia, Inc., is headquartered in Atlanta, Georgia. For 39 years, Mellow Mushroom Pizza Bakers has been serving up fresh stone baked pizzas to order in an eclectic, art filled and family friendly environment. Each Mellow has a unique vibe focused around great customer service and high quality food. For more information on Mellow Mushroom Pizza Bakers, like us on Facebook at facebook.com/mellowmushroomHQ, follow us on Twitter at twitter.com/MellowMushroom and follow us on Pinterest at pinterest.com/mellowmushroom. Mellow Mushroom is a proud partner of the Share Our Strength organization and also of the Dine Out for No Kid Hungry program; the latter runs every September. Take the pledge and learn how you can help end childhood hunger by 2015 at shareourstrength.org.